As I mentioned on Monday, Angelico Press has released a new series of volumes on Anne Catherine Emmerich (12 volumes, to be precise, available in paper and cloth) that contain by far the most complete and accurate translation into contemporary English of her visions. The volumes are conveniently divided into themes, so that, for example, one who wishes to read everything the mystic has to say about the Blessed Virgin Mary may find it all in volume 8. And here, if I may, I should like to insert a note to readers. I was frankly astonished to see in the readers' comments the level of negativity that was directed toward Anne Catherine Emmerich in particular, and toward mystical visions in general. It is perfectly obvious, on the one hand, that some people can get carried away with such things and thereby fail to hold fast to the fundamentals of the Faith (as some other rare specimens might get carried away with liturgical finery or exquisite dogmatic distinctions); but it is also no less obvious that some have developed a disdainful attitude towards the rich Catholic history of mysticism, reminiscent in fact of the skeptical mindset of so-called "scientific reason" and the contempt for subjective devotion found in the first wave of the Liturgical Movement, by which it eventually vomited forth the rationalistic, linear-modular, didactic, symbol-bereft, unimaginative, and utterly unmystical modern liturgy, under the ill effects of which all Latin-rite Catholics are, to one degree or another, suffering. Personally, I am not wedded to mystical visions as if they were Gospel truth or as if one "had to read" them in order to be saved, or any such nonsense. I simply find them (at their best) refreshing, intriguing, thought-provoking, insight-begetting. They help me to make connections that I hadn't made before; they lead me back to the sources of the Faith with renewed appreciation. Can one not approach such writings with theological open-mindedness, and with an innocent enjoyment of religious literature? Must we reject the use because of the abuse? Shall we dismiss a surprisingly large part of the medieval Catholic heritage because it disturbs our tidy conception of a catechetical, rubrical, juridical, and scholastic universe? One thinks naturally of the glorious visions of St. Gertrude the Great, one of the greatest saints of the Benedictine order. I am sure that Our Lord would not have honored her by placing seven rings on her hand — a golden circlet on each finger, and on the signet finger, three — if He had thought she did not deserve it; and it would seem that her larger monastic family willingly concurs with the Lord by honoring this saint with three sets of special antiphons for Vespers I, Lauds, and Vespers II, something unique, as far as I know, in the entire Antiphonale Monasticum. 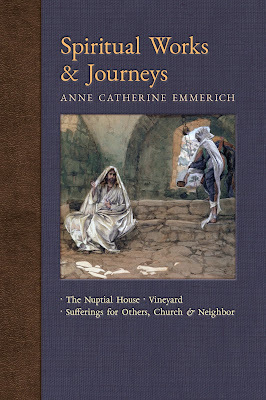 Today I would like to share some striking passages from volume 11, Spiritual Works and Journeys: The Nuptial House, Vineyard, Sufferings for Others, the Church, and the Neighbor, in which Anne Catherine speaks about the Holy Sacrifice of the Mass and the Most Blessed Sacrament. As will become evident, she was at once powerfully drawn into these mysteries with burning desire, as well as painfully aware of the irreverence, lukewarmness, and routine neglect that surrounded these great gifts of God in her own day. The parallels to our times will not be hard to see. It is also beautiful to note, throughout these volumes, how much Anne Catherine's visions were linked to the liturgical calendar and the sanctoral cycle in particular. She seemed to have internalized the calendar to such an extent that its themes and rhythm became the guiding lines of her interior world. She intensely lived the very mysteries re-presented in the sacred liturgy, not only the mysteries of Our Lord, but also those of all of His saints, who are present to us in a special way on their feasts. To purchase this volume, go to its page at Angelico Press.